Are you looking for the Skeleton (lore)? As iconic as zombies, animated human skeletons have been featured in all of the Diablo games, and just about every other fantasy RPG ever made. 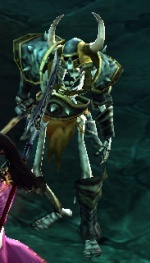 In Diablo 3, plain skeleton warriors are joined Skeletal Summoners, Skeletal Archers, Skeletal Shieldmen, Skeletal Executioners and more. These skeletons spawn in mixed packs and work together with much better AI than they've shown in the previous games in the series. This "plain" sort of Skeleton with a sword is quite straight forward, and is mostly only dangerous in large packs, or together with other skeletal types. Avoid being surrounded, and kill other high priority targets first. They typically have a somewhat slow movement speed, normal swing speed, and low damage. Physical melee attack. Blocks your attacks with shield but unblocks to attack. The shield can be destroyed leaving the Shieldman unable to block any further attacks with it. Attacks with a ranged Arcane Orb. Can summon up to four Retruned at one time. Physical ranged attack with bow. Physical melee attack with sword. Blocks your attacks with a shield but lowers it to attack. The shield can be destroyed leaving the Marauder unable to block any further attacks with it. Physical melee attack with one-handed axe. Blocks your attacks with a shield but lowers it to attack. The shield can be destroyed leaving the Raider unable to block any further attacks with it. Physical melee attack with one-handed sword. Blocks your attacks with a shield but lowers it to attack. The shield can be destroyed leaving the Raider unable to block any further attacks with it. Physical melee attack with sword. Physical melee attack with slow two-handed axe. Attacks with a ranged Arcane Orb. Can summon up to four Skeletal Marauders at one time. Physical melee attack with slow two-handed axe. His walking speed is faster than the Skull Cleaver. Attacks with a ranged Arcane Orb. Can summon up to four Skeletons at one time. They are very easy to kill so dispense with them first to stop them summoning. Attacks with a ranged Arcane Orb. Can summon up to four Returned Archers at one time. Axegrave the Executioner - The Keep Depths. Boneripper - The Keep Depths. Part of Forged in Battle event. During the last days of King Leoric's reign, even the skeletons of the ancient dead could not rest. They took up their broken armor and weapons once more -- ready to cut down anything that yet drew breath. Though wasted and fragile, these creatures possess a twisted cleverness that makes them quite formidable. 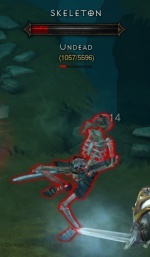 A Skeletal Summoner showing off. This page was last edited on 27 September 2014, at 11:12.